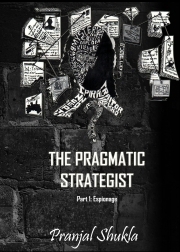 Description of "The Pragmatic Strategist"
The story which no one knew. The story which no one knows. Based in the country of colours and festivals, India. The story of a team on a mission led by a man. His tactics and strategies are feared by many but known to none. He observes everything without watching anything, does everything without doing anything. Welcome to the world of The Pragmatic Strategist. Pranjal Shukla, born in India and currently pursuing education in Science and Maths from Amity International School. Started writing at the age of 14 on various social issues and things he observed. His first book-"The Index of my heart" is a collection of speeches, articles and poems written by him. His second book-"The Pragmatic Strategist: Espionage" , written at the age of 15, is a thriller fiction about a team working on a high class mission. He terms himself as a day dreamer. He is also a part of a band and can play the acoustic guitar, electric guitar, bass guitar, keyboard and sometimes sing too but still thinks of himself as a bathroom singer. He also is a part of the debating society and takes keen interest in debating competitions, MUN simulations and youth parliaments for which he has bagged many awards too. He likes to play basketball in his leisure time and was once a part of the school team too. Reviews of "The Pragmatic Strategist"